Chevrolet has been building trucks for over 100 years. During that time, it’s perfected the art of crafting a half-ton pickup. Case in point – the 2018 Silverado. There are countless reasons why you should buy the current Silverado But, for the sake of keeping this article a readable length, we’ve listed the top 5. Although pickup truck owners are mostly concerned with a vehicles performance, they still like a rig that turns heads. 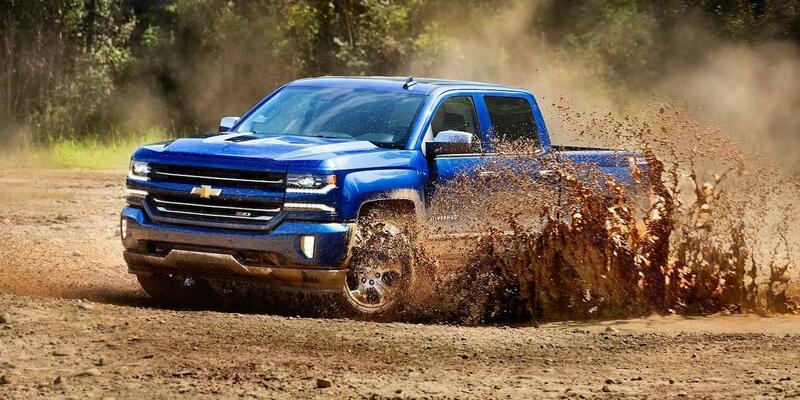 The Silverado is the truck for the job, with muscular body lines and a bold front grille. Inside, the truck is just as stylish, with high-quality materials and a well laid out design. Those old enough will remember the early 90s, “Like a Rock” Chevrolet commercial line. Things haven’t changed – the Silverado is still built rock solid, with the ability to handle just about any task. This capability comes curtesy of a lineup of powerful drivetrain options. Under the hood of Silverado, you’ll find one of three available engines: a 4.3L V6, a 5.3L V6 or a 6.2L V8. All boast plenty of grunt, with the top-of-the-line 6.2L putting out 420 hp and 460 lb-ft. When properly equipped, this engine gives the truck a class-leading, 12,500 lb towing capacity. Each engine is a testament to modern engineering. The entire lineup is offered with fuel saving technology, such as active fuel management and variable valve timing. Light-electric eAssist is also available on the 5.3L V8. Transmission options include either a 6-speed or 8-speed automatic. A choice of rear-wheel drive or four-wheel drive is offered. Several special edition models are available for 2018, so you can pick a Silverado to match your personality. Centennial: To celebrate 100 years of trucks, Chevrolet released the Centennial edition. It comes complete with unique heritage badging and chrome accessories. Redline: Red and black accents, along with 20” wheels, help the urbanized Redline edition stand out wherever it goes. Midnight: The midnight edition sports a blacked-out trim and aggressive off-road tires for a truly sinister look. Rally: As you might guess, the Rally model is built for the street, with large diameter wheels and rally striping. High Desert: Magnetic Ride Control and a lockable storage system make the High Desert model as capable on-road as it is off. Realtree: Realtree models are a hunter’s dream, sporting the company’s trademark graphics and camouflage accents. Special Ops: Chevrolet has partnered with the Navy SEAL Museum to help the families of veteran and active military personnel. The Special Ops model is a rolling tribute to this partnership, sporting naval inspired graphics and black accents. The Silverado is a workhorse at the jobsite, and a rolling technology hub when the 5 O’clock whistle blows. Onboard, you’ll find 4G LTE Wi-Fi, the Chevy MyLink infotainment (complete with Apple CarPlay and Android Auto), a premium audio system and much, much more. State-of-the-art safety features aren’t just for cars anymore. The Silverado keeps you and your loved ones protected with functions like automatic braking, lane keep assist with lane departure warning, forward collision alert and a safety driver alert seat. There’s also park assist, a rear vision camera – and perhaps, best of all, Teen Driver Mode. To encourage safe driving habits in young drivers, Teen Driver Mode allows guardians to set limits on vehicle speed and other parameters. A 2018 Silverado would look great sitting in your driveway. Visit Essig Motors today, to find the Silverado that’s right for you.